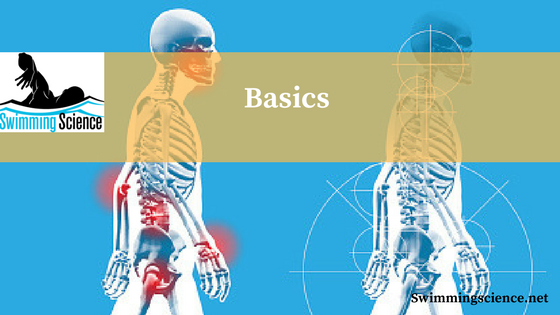 When describing joint movement, a reference position is needed. This position is termed the anatomic reference position. This position entails: an erect standing position with the feet slightly separated, the arms hanging by the side, the elbows straight, and with the palms of the hands facing forward. The following planes are described relative to the median plane, which bisects the body vertically at the navel, dividing the body exactly into left and right halves. A sagittal plane is any plane parallel to the median plane and divides the body into unequal right and left halves. 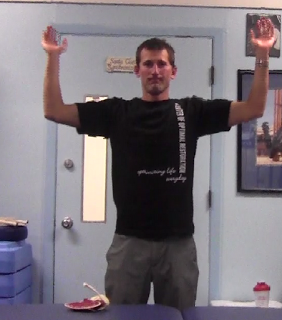 Moving your arms in forward, in front of you is in the sagittal plane. The sagittal plane is used when an athlete throws their arms forward off the starting block. 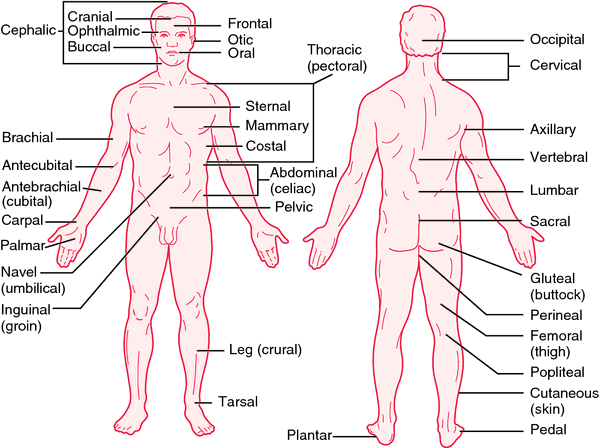 A frontal plane is a vertical plane at a right angle to the sagittal plane. If you draw a line from one ear to another from above the head and then divide the whole body along this line, the plane formed will be a frontal plane. If you made a snow angel or perform an outsweep in breaststroke you’d be moving in the frontal plane. It is also known as the coronal plane. A transverse plane is a horizontal plane of the body and cuts the body between top and bottom halves. It is perpendicular to both frontal and sagittal plane. The catch phase in freestyle utilizes the transverse plane. Any plane other than the above-described planes will be an oblique plane. Anything situated near or towards the front. When a swimmer is in the catch phase of freestyle, their arm is anterior to their body. Anything situated near or towards the back. During the recovery of freestyle, a swimmer’s arm is posterior to their body. Anything situated near or towards the head. When the swimmer’s hand enters the water it is superior to their body. Anything situated near or towards the feet. If the swimmer pulls downward during the catch, their hand is moving inferior or towards the feet. Anything situated near or towards the center. If during the catch phase the swimmer moves towards the body, like a cross over the catch, then their arm is moving in the medial plane (near the middle of the body). Anything situated near or towards the outside. During the recovery phase of freestyle, if the swimmer’s arm is wide it is moving away from the middle of the body laterally. Anything situated near or that is coming closer. In freestyle, if the swimmer demonstrates a shallow catch then their hand is proximal or near their trunk. Anything situated or moving away. If the swimmer pulls deep during the catch phase of freestyle, then their arm is distal (away from the trunk). The shoulder consists of four main joints: sternoclavicular, glenohumeral, scapulothoracic, and acromioclavicular. These joints allow remarkable ranges of motion in several planes of movement. The scapula is moved posteriorly and medially along a transverse plane, moving the arm and shoulder joint posteriorly. 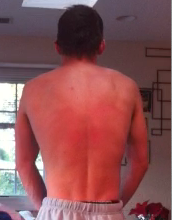 Retracting both shoulder blades gives a sensation of “squeezing the shoulder blades together”. This movement commonly occurs during a rowing movement and should occur in the catch phase of swimming. 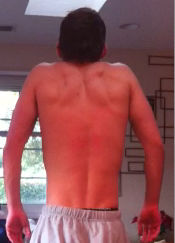 The shoulder blades are raised in a shrugging motion. The scapula are elevated when a swimmer’s arm enters the water during freestyle. The scapula is lowered from elevation to a depressed position. The scapulae may be depressed so that the angle formed by the neck and shoulders is obtuse, giving the appearance of “slumped” shoulders. This is most noted in swimmers with poor posture outside the pool. 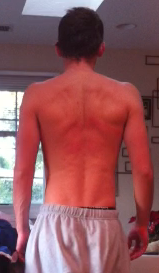 Rarely are the shoulders depressed during swimming. Moving the scapulae to rotate the glenoid upward. Whenever the arm moves overhead the shoulder blade upwardly rotates to provide safe movement, avoiding impingement of the rotator cuff muscles. This movement is specifically controlled by the: serratus anterior, lower trapezius, upper trapezius (more on them later). The opposite of upward rotation, downward rotation occurs as the arm returns from being overhead. The scapula moves so the glenoid faces downward. The scapula moves toward the back of the body, orienting the glenoid posteriorly. 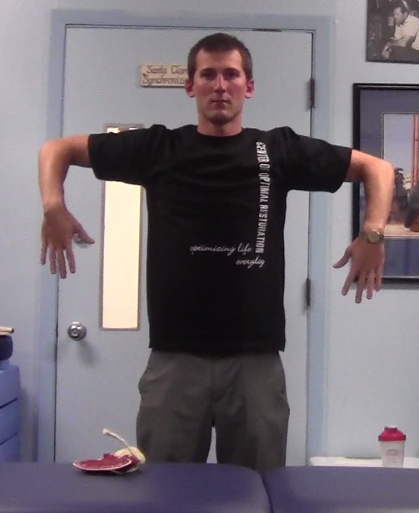 This occurs during overhead movement, specifically flexion. The opposite of posterior tilt, as the scapula moves towards the front of the body the glenoid is oriented anteriorly. This occurs when the arm is lowered from overhead movements. Arm abduction occurs when the arms are held at the sides, parallel to the length of the torso, and then raised in the frontal plane. This movement may be broken down into two parts: true abduction of the arm, which takes the humerus from parallel to the spine to perpendicular; and upward rotation of the scapula, which raises the humerus above the shoulders until it points upwards. 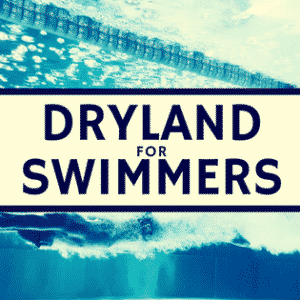 This motion occurs in the frontal plane during the outsweep of breaststroke or during a wide freestyle catch. The humerus is rotated out of the plane of the torso so that it points forward (anteriorly). This motion occurs in the sagittal plane during the recovery of backstroke or when the arms shoot forward off the block. The humerus is rotated out of the plane of the torso so that it points backward (posteriorly). 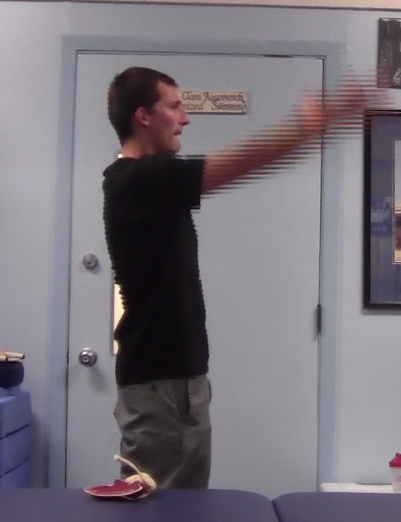 This motion is the opposite of flexion but still occurs in the sagittal plane. 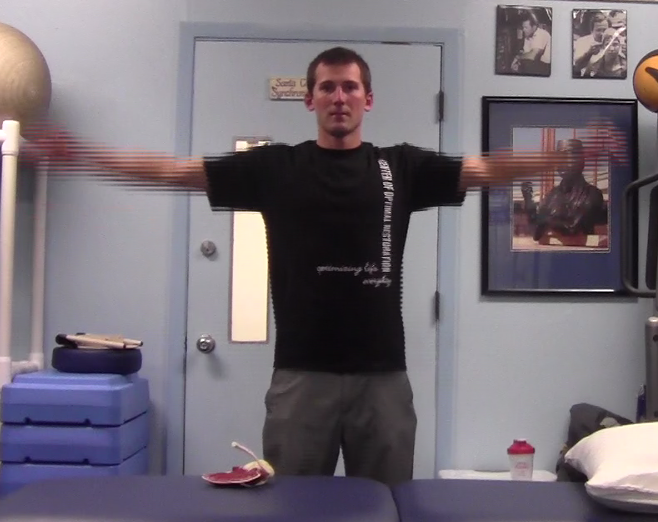 The glenohumeral joint undergoes extension while the athlete pulls during freestyle. Internal rotation of the arm is most easily observed when the elbow and shoulder are held at a 90-degree angle of flexion. Internal rotation occurs when the arm is rotated at the shoulder so that the fingers change from pointing straight forward to pointing towards (perpendicular) the ground. This motion occurs during the catch phase of freestyle while the swimmer achieves an early vertical catch. External rotation of the glenohumeral joint is the opposite of internal rotation of the arm. External rotation occurs when the arm is rotated at the shoulder so that the fingers change from pointing straight forward to pointing towards (perpendicular) the ceiling. 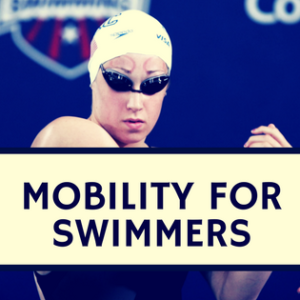 This motion is rarely utilized in swimming and can lead to muscular imbalances between the internal and external rotator muscles. First class lever: when two forces are applied on either side of an axis and the fulcrum lies between the effort and the load. For example, a seesaw or the triceps at the elbow joint. Second class lever: when the load is applied between the fulcrum and the point where the effort is exerted. Less resistance is necessary to move a load. Like carrying wheelbarrow or isolated contraction of the brachioradialis. Third class lever: when the load is located at the end of the lever and the effort lies between the fulcrum and the load. This is like a drawbridge or flexion at the elbow. Most movable joints in the body. Force equals mass times acceleration and is a vector quantity, meaning that it’s displayed in a particular direction. Force is usually measured in Newtons. GRF stands for ground reaction force. When you jump, sprint, or perform an Olympic lift, you exert force into the ground. Force-plates measure these forces. During vertical jumping, most of the force produced is vertical. However, in sprinting, you have vertical forces as well as horizontal forces. When the foot strikes the ground during maximum speed sprinting, at first the force is projected forward which is called braking forces, and once the COM passes over the foot, the force is projected rearward which is called propulsive forces. In general, force, including GRF, is measured in Newtons. When muscles contract or are stretched, they create muscle force. This muscle force pulls on bones which creates joint torque. In general, force, including muscle force, is measured in Newtons. second, but can also be expressed in miles per hour or kilometers per hour. Vectors contain both magnitudes and directions. Force, velocity, and acceleration are all vector quantities. You can plot the force-velocity curve on a graph by plotng force on the y-axis and velocity on the x-axis. In strength & conditioning, the goal is to shift the curve upward and to the right so that the athlete can exhibit more force and power at every possible load. Heavy strength training tends to shift the curve more on the force end of the spectrum, whereas explosive training tends to shift the curve more on the velocity end of the spectrum. Joints in the human body move through arcs and therefore accelerate through a range of angular motion. Joint angular velocity is the rate of change of joint movement, often measured in degrees per second or radians per second. Power is the rate of doing work. It is calculated either by dividing work by time, or by multiplying force by velocity. Power is usually reported in watts. It is possible to measure the power output of individual joints during movement by multiplying the torque by the joint angular velocity. It is usually reported in Newton-meters per second. RFD stands for rate of force development and can be measured in multiple ways. RFD is believed to be highly important in sports that require rapid force generation. It is usually measured in Newtons per second. RTD stands for rate of torque development and is usually measured in Newton-meters per second. RER stands for rate of EMG rise and represents the rate of increase in muscle activation. RER is typically measured in % of MVC per millisecond or millivolts per second. Work is equal to force times distance and is generally reported in joules. Momentum is mass times velocity and is reported in kilogram-meters per second. A moment is a turning effect produced by a force. It is often synonymous with torque, which can be thought of as the rotational analog to linear force (turning force), and is calculated by multiplying the perpendicular force by the distance from the pivot (or axis of rotation). Resistance in strength training produces an external moment, whereas muscles produce an internal moment to counteract the external moment. Moments are usually measured in Newton-meters. You can plot the torque-angle curve on a graph by plotting the torque on the y-axis and the joint angle on the x-axis. Stiffness is the rigidity of an object and can be thought of as the extent to which it resists deformation in response to an applied force. The stiffer the object, the harder it is to deform. Stiffness is usually measured in Newtons per meter or pounds per inch. The opposite of stiffness is compliance. The more compliant the object, the easier it is to deform. A peak is the greatest magnitude of a set of data, or the highest point measured. A mean is simply on average of a set of data and is calculated by combining a set of data and dividing by the number of figures. In biomechanics, the term relative commonly means relative to one’s bodyweight and is calculated by dividing a figure by one’s bodyweight. In biomechanics, the term absolute commonly means the total amount regardless of body weight. EMG stands for electromyography and is a technique for recording and analyzing the electrical activity produced by skeletal muscles. The onset time in EMG is the time that elapses between an occurrence and detectable muscle activation. movement takes place at a constant speed. Isoinertial exercise maintains constant mass and is characteristic of typical free weight exercises that are commonly employed in strength training. PAP stands for post-activation potentiation which is a phenomenon whereby performance is enhanced following previous muscle activation. ROM stands for the range of motion and is typically measured in degrees or radians. Displacement is a change in position of a body. It can be translational, rotational, or a combination of both. CMJ stands for countermovement jump and is a common test used in research to measure jumping ability. It begins in the standing position with hands on the hip and involves a rapid countermovement until the knees reach 90-degree angle, whereby the movement is explosively reversed. The squat jump (SJ) is a common test used in research to measure jumping ability and is performed starting in the bottom position at a 90-degree knee angle with the hands on the hip, no arm swing, and no countermovement. Maximum voluntary contraction (MVC), or sometimes referred to as MVIC for maximum voluntary isometric contraction, is the measurement of the greatest possible output that the individual can create by their own volition. MVC could be used in electromyography (EMG) or with torque measurements using isokinetic dynamometers. Concentric muscle actions occur when muscles shorten under tension. Eccentric muscle actions occur when muscles lengthen under tension (technically it’s not a contraction). Plyometric exercises take advantage of the stretch-shortening cycle (SSC) whereby a muscle rapidly lengthens and then explosively reverses its action. jumping can average 0.2 seconds. In biomechanics, often forces in opposite directions are combined to create a single net force. For example, net horizontal force is the sum of braking (negative) and propulsive (positive) forces. is as a point in space determined by a distribution of mass, whereby a uniform force acting on that mass would act as if the distribution were located at just that point. Sometimes the term center of gravity (COG) is used in place of COM. In biomechanics, active muscle forces are generated by muscle contractions, namely the sarcomeres. In biomechanics, passive muscle forces are generated by the elastic properties of materials such as those found in muscles (collagen, titin, etc. ), ligaments, bones, tendons, and fascia. example, combining horizontal and vertical forces into a resultant force. 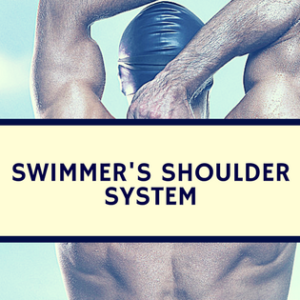 Terms and descriptions are taken from the Swimmer’s Shoulder System and Bret Contreras available for purchase.